Light Design is a specialist supplier of pyrotechnics equipment available for hire for any type of display or show. From our base in London we are able to supply high end safe pyrotechnics show products or an actual pyrotechnics display for your event what eve the occasion what ever the budget. We can supply breathtaking complete pyrotechnics solutions to our full range of customers either in London, Essex, or any of the Home Counties or in fact supply a show or display anywhere in the UK! Light Design can supply bespoke pyrotechnics show solutions to a whole range of customer requiring that ultimate special effect for there event. 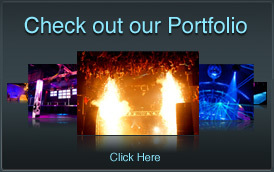 Light Design has supplied pyrotechnics display systems to a varied range of customers, for ever possible type of event. We have supplied equipment for product launches, weddings, corporate events, concerts, tours, theatrical productions, dance and live events, TV, and music videos. Have confidence that when you need that special something for your event Light Design have a team of experienced pyro technicians to make an exhilarating and impacting visual show so for more on pyrotechnics and to see what we can do for you contact us now for more information. 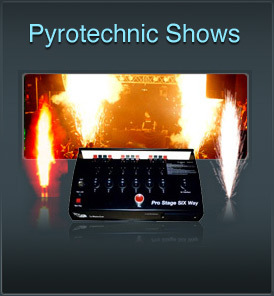 Light Design has many pyrotechnics special effects in stock from the UK’s leading pyrotechnics manufacturer Le Maitre. 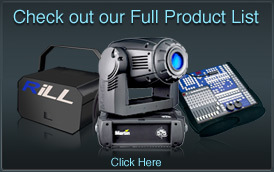 Choose from our range of specialist effects when planning your show or display. Let us help plan your show exactly how you want it choose from stunning silver jet pyrotechnics that are either 2 or 5 metres high showering silver sparks in a fountain over you stage, make your event start with a flash and a bang with loud report theatrical flashes a loud bomb like bang accompanied by a bright white flash will help to get things started. Finish your show with cold fallout glitter effects in silver or gold or a whole range of confetti effects. Raise the temperature in the room with flame projectors a 2 or 5 metre high flame exploding then burning for several seconds. For bigger show and display productions choose from our prostage range of professional effects and enjoy gorgeous water fall effects, even stage mines to wow you audience and give them something that special sparkle that breathtaking effect to remember forever! Light Design has a team of experienced pyro technicians that can help execute your demanding pyrotechnics production to perfection. We have several technicians that can work with you on ever step of your design and plan your show or display they will then operate on the day of the event to ensure every thing is exactly as you planned it. Light design take our health and safety very seriously when it comes to blowing things up so rest assured all light design pyrotechnics productions are covered by our comprehensive insurance we also liaise with local councils and health and safety officials to gain permission to use pyrotechnics equipment at you event .All applications are made in accordance with health and safety executive HSG guidelines with risk assessment supplied for all aspects of a pyrotechnics production, we take on board and implement all elements of COSHH and RIDDOR regulations so you show or display is safe in our hands! Light Design are a high end production show and display company that supply pyrotechnics show products to a whole range of customers across the country so let us blast your production or explode your special event to new heights with our impressive range of le maitre pyro effects. So whatever you requirements no matter how big or small contact light design today and let us give you a pyrotechnics display you will never forget!